Have him unroll a mat and have him bring over the material to the mats. Put the box of cards on the lower part of the mat. Take out the card for 1 and ask the child what it is. Take out the card written 10 and ask the child what it is. Notice how many zeros are in the number 10. Take out the card written 100 and name it. Notice how many zeros 100 has. Take out the card written 1000 and name it. Notice the zeros. Also notice the colors of the cards. Do a Three-Period lesson for 1, 10, 100, 1000. Place card 1 at the top right of the mat. Take out the unit cards and place card 2 under card 1. Have the child name card 2. Repeat for all of the unit cards (the child can do this). 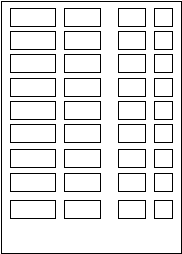 Repeat for the 10’s by placing them in a column to the right of the units. Repeat for the and 100’s and 1000’s cards. Always making the column to the right of the preceding cards. Do a Three Period Lesson. Each time, as how many zeros are in the number. Have the child collect the cards. Mix them and place them randomly in their correct columns. Have the child pick up one column at a time (beginning with the unit cards) and replacing them in the column in order. Have the child repeat for the other three columns. Each time the child replaces the cards in order, have him say what it is. For example, “1 unit” for 1, or “3 tens” for 30, or “8 hundreds” for 800, or “5 thousands” for 5000, etc. Once all of the cards have been lain out, have the child count, using the decimal quantity: 1 unit, 2 units, 3 units, etc. Each time, asking how many zeros there are. Once done, have the child put the material away. quantities/categories of the decimal system.